On a day traditionally connected with playing practical jokes on others, I just played a big one on myself. I don’t know what possessed me to sit down and watch Roberto Benigni’s 2002 fantasy / comedy, Pinocchio, but whatever it was, I hope it never rears its ugly head again! It’s a shame, too, because Pinocchio is actually a beautiful motion picture, with tons of amazing visuals. 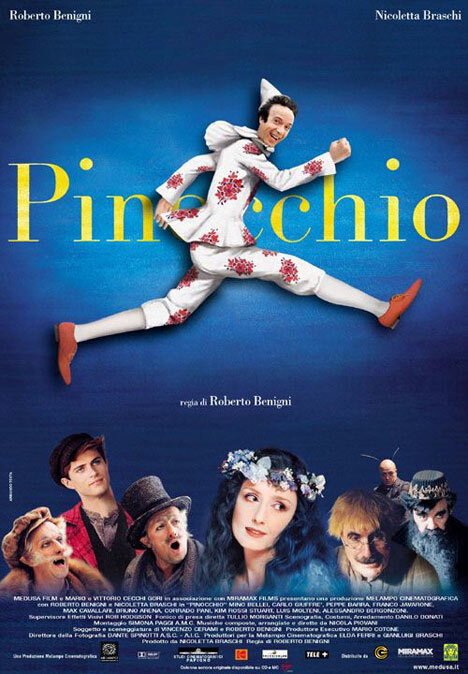 What sinks it, however, is Benigni’s performance as the little wooden boy. To put it simply, this was a casting error of epic proportions! The story is a familiar one: Geppetto (Carlo Giuffre), an elderly woodworker, stumbles upon a magical wooden log, from which he carves a puppet that miraculously springs to life. Having always wanted a son, Geppetto takes the puppet in and names him Pinocchio (Benigni), who - not schooled in the ways of the world - gets into all sorts of mischief. He’s nearly mugged by a Fox (Bruno Arena) and Cat (Max Cavallari), and is warned by the Blue Fairy (Nicoletta Braschi) not to tell a lie, or his nose will grow. But Pinocchio does as he pleases, and teams up with a rascal named Lucignola (Kim Rossi Stuart) who convinces the wooden boy that life is all about having fun. Unfortunately, Pinocchio’s antics lead to tragedy when Geppetto, while out looking for his lost “son”, presumably drowns, leaving Pinocchio all alone in a world that, as he’ll soon discover, can be a cruel and lonely place. As mentioned above, this version of Pinocchio is absolutely beautiful; the set pieces are stunning (during his travels, Pinocchio moves from one breathtaking locale to the next), and it’s obvious a great deal of talent went into creating this magical world. Sadly, when it came time to cast the movie, that "talent" was nowhere to be found! It’s not that I don’t like Benigni as an actor: he was entertaining in Down by Law and Night on Earth, two Jim Jarmusch films, and his boisterous personality was the perfect fit for 1997’s Life is Beautiful, which he also directed. But the very notion that a 50-year-old man would be convincing as a young boy, even a wooden one, was ludicrous from the start. To make matters worse, his incessant over-acting will be working your last nerve not five minutes after he first appears on screen. Pinocchio has a few other problems as well: its story is erratic and, despite the fact something new and visually exciting pops up every couple of minutes, the film is somewhat dull. Still, with its magnificent production design (handled by longtime Fellini collaborator Danilo Donati, who died shortly after working on this movie), these issues could have easily been overlooked. What put Pinocchio down for the count was the monumentally annoying performance of its star / director as the title character. I can’t tell you how much I wanted to take an axe to his “little wooden boy”!